TiEQuest is an annual business venture competition for all North American startups that is held in Toronto to encourage entrepreneurship, engage emerging entrepreneurial talent and to create an ecosystem of entrepreneurship. The mission of TiEQuest is to connect entrepreneurs and business enthusiasts with the private equity and venture capital industry. 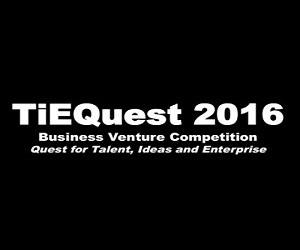 TieQuest offers over $100,000 in prizes, extensive mentoring, network opportunities and multi-stage competition. The top competitors receive a sponsored trip to TiECON in California! What makes TiEQuest different from any other competition is the mentoring expertise offered to the participating entrepreneurs. TiEQuest contestants have gone on to raise Angel & Venture Capital financing worth over $40 million, grown their businesses significantly and have been acquired by leading international organizations. The panel of judges of TiEQuest largely comprise of fund managers, angel investors and venture capitalists. There is a $125 entry fee for a venture to participate in the competition, which also entitles the contestant to one regular membership for a period of one year in TiE Toronto.